Coalition forces in Iraq have lifted the curfew for the holy month of Ramadan. A curfew has been in place since the end of the war, but coalition officials say the lifting of the curfew early on Sunday morning was possible because the security situation has improved. Now Iraqis who will be fasting all day can go out to socialise in the evenings. Ramadan is about to start across the Muslim world - in Egypt on Sunday and in Saudi Arabia and other Gulf states on Monday. Muslims believe Ramadan was the month when God began to reveal the Koran, the Islamic holy book, to the Prophet Muhammad 1,400 years ago. The holy month is calculated according to the lunar calendar and begins on the first day after the sighting of the new moon. Senior religious councils in the Gulf said the moon's crescent had not been sighted after nightfall on Saturday, meaning Ramadan would not start until Monday. Ali Gomaa, Egypt's official Mufti, said as the new moon had been sighted Ramadan would begin on Sunday. While Sunnis mark the start of the holy month by the crescent moon, the Shia calculate it according to astronomical configurations. In Lebanon and Syria, the leaders of the Sunni and Shia Muslim communities said that Ramadan would start on Monday. Fasting in Ramadan - avoiding all food, drink, smoking and sexual relations from dawn to sunset - is a religious requirement for all Muslims who are physically able and is one of the "five pillars" of Islam. 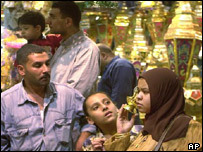 Business tends to slow down during the daytime in Ramadan, but shops and restaurants remain open until after midnight. The month for many Muslims is a time for extravagant night time banquets, get-togethers with family and friends and staying up late to have one last meal before sunrise. 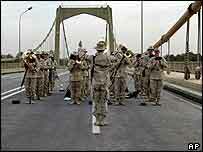 Coalition forces serving in Iraq has been told to refrain from eating drinking and smoking in public. "We're making sure our forces clearly understand what the traditions are, and what the sensitivities are to make sure that we're being respectful of the Iraqi people," said Lieutenant General Ricardo Sanchez, commander of US and coalition troops. Troops have been attending "cultural sensitivity" classes, where instructors, mostly chaplains, explain Islamic traditions and the meaning of the Islamic holy month. On Saturday, coalition authorities reopened the 14th July bridge in Baghdad across the Tigris River on Saturday to ease traffic congestion - a gesture aimed at improving the Americans' image in Iraq. But after Sunday's attack on the Rashid hotel - which is only about 200 metres away - access to the bridge was blocked again. "The holy month of Ramadan has started in the most unholy way"